Our six-panel steel combo doors are pre-hung and squared for easy installation. Inside, 1 3/4″ thick core features pressed steel insulated panels,covered with white vinyl for easy cleaning and to prevent rust. Cores are pre-drilled for both entrance and deadbolt locks. Attractive wide-angle brushed chrome knocker and viewer installed insures privacy and lets you see before you open the door. Entrance and deadbolt key-a-like lock sets are available in our hardware section. Both left or right hand hinge option available. See below on how to order. 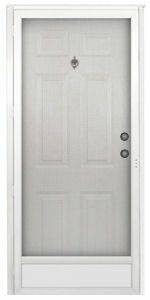 Mounted storm door is all aluminum with white durable finish. All of our storm doors feature safety glass panels. Full view storm door invites the sun and light into your home and brightens any room. Storm door hardware is available in both white or black finish. See our door hardware section to order. Unless otherwise requested, all combo doors have 4″ jamb. Other sizes available, call for quote and lead time. Most listed sizes in stock. HOW TO ORDER: First select the storm door style you want. Self store, full view or all glass. Click on “SELECT HINGE OPTION” and choose left or right hand hinge. TIP: to choose the correct hinge, stand outside your home facing the door. Do you want the hinge on the left or right? Got It? Next click on “SELECT SIZE OPTION” and choose your size. Remember, all door sizes are rough openings. The rough opening is the hole size after you remove the old door. You are now ready to order your combo entrance door. HOW TO ORDER THE RIGHT SIZE: Go to our “HOW-TO’s” Icon and choose how to measure and install your mobile home door. NEED HELP? Call 1-800-368-6208 and speak to one of our professionals. We can help! Don’t forget to order your locks, storm door hardware, storm door chain, sealers, and screws. If your home has vinyl siding, we have a J-Channel vinyl molding that will make installation easy. We have it all!